Liam-J-Cross Writing&Editing | Home of all things writing! We are a company with a burning passion for all things written. Writing is wonderful. It can be simple, it can be complex; richly detailed or plainly put. It can make us laugh, it can make us cry, it can make us smile, and it can make us frown. Writing makes us feel. Its power can be harnessed to evoke emotion in even the driest, dullest, most life-sapping souls. And those are the reasons writing is so wonderfully brilliant. The reasons we love it so much. 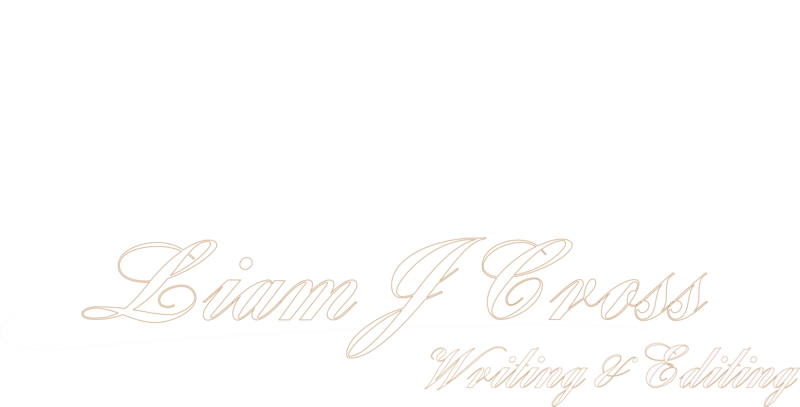 Here at Liam-J-Cross Writing & Editing, we pride ourselves on absolute client satisfaction. No piece of work is complete until you consider it so. We would rather redraft a piece a thousand times, fixing even the tiniest little details over and over and over again, than ever see a client leave dissatisfied with our services. We provide professional and affordable editing services that are based on the rigorous standards of the publishing industry. Whether you’re an indie author looking to fine-tune your work prior to publication, or a solo writer who is looking to polish their manuscript before submission – we have the package for you. We boast a fine team of editors who each specialise in their own unique field. This allows us to cover each specialist editing type, and better yet, allows us to offer a comprehensive editing package in which each edit is carried out back-to-back with no additional fees. This means that your book gets the full treatment for a fraction of the price. Good editing is based around two things: a solid knowledge of the industry, and a clear understanding of the development of the unique writing voice. It’s about making a book align with the industry standards and conventions (based on its structural and content genres), but in a way that makes it stand out from the overcrowded marketplace or dreaded slush pile. Your job as a writer is to get the words on the page. Our job as editing experts is to take those already-wonderful words and sprinkle them with expert knowledge. You write; we refine. And together, we’ll create one expertly crafted manuscript that’s ready to take on the big wide publishing world. That’s our story, told by us, on our very own website. Sure, it could be a little biased, but we prefer not to be. Instead of trying to validate that with further words, we thought we’d let our clients tell you with theirs. Take a look at what our clients have to say about us: testimonials. What is the story of your book? How did it make the journey from a tiny seed in your brain, to a fully blossomed rose on paper? Think about that for a moment. Go deep into the details of your book and its content, and think about how amazing it really is. Writing a book is hard. You should congratulate yourself. See what type of edit would best suit you: ghostwriting and editing services. If you’d like to reach us with any inquiries, or have a question regarding our services, experience, or pricing, send an email via the contact form below. If you’d like to schedule a free, no-obligations consultation call, please click here.